← How to open a large PDF files on web without wasting time? Question:I have different WebPages that simulate single A4 press pages.I'm looking for a method to save these as PDF exactly as they render on the browser (images, fonts, styles, margin...) without adds like text headers, footers, pagination or anything else.I tried with fake printers like adobe PDF printer but they add header/footer and the resulting PDF it's not exactly as the browser. I'm open to PHP server, desktop software, browser plug-in... solutions, is there any one on VeryPDF? VeryPDF cloud based application can work at any computer system or platforms, so you can run the conversion under Mac, Window, Linux or Android system easily. If you need to use this API without any limitation, please buy an API code, which could be applied to all the VeryPDF API applications. API code will be sent to your email box after you register an account on registration page and pay for it. When run the conversion, please open any browser and then input URL according to usage then you can get converted PDF file. Save webpage to PDF by API without adding text header. 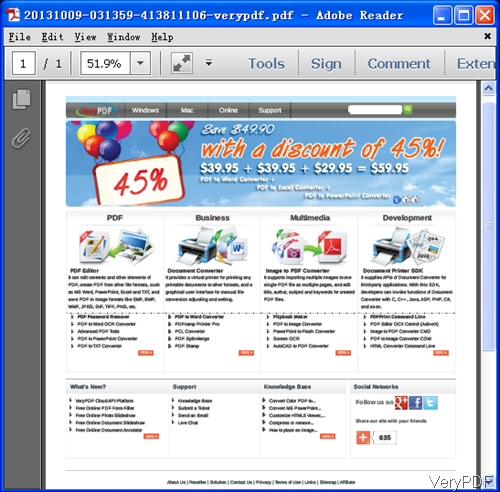 By this URL, we can save website of VeryPDF to PDF. Now let us check the conversion effect from the following snapshot. There is no footer, header or others produced. It is totally same with website content. Meanwhile there are many parameters which can help you do other settings to the output PDF. Here I take some examples for you to check. --custom-header-propagation:Add HTTP headers specified by --custom-header for each resource request. --no-custom-header-propagation:Do not add HTTP headers specified by custom-header for each resource request. This software will not add anything unless you need to add footer, header or others. Please check more parameters of this software on homepage, there are too many, I can not list all of them here. During the using, if you have any question, please contact us as soon as possible. How to convert multiple webpages to PDF? How to print webpage to pdf? What's API for converting Word docs to PDF that does NOT require Office to be installed? How to fill PDF form by FDF through cloud API? This entry was posted in VeryPDF Cloud API and tagged webpage to PDF. Bookmark the permalink.